Today, vaccination is a part of our lives, but it hasn't always been! We need to go back several hundred years, to the discovery of vaccination by Dr. Edward Jenner, followed by the development of the very first vaccine by his more famous successor, Dr. Louis Pasteur. At that time, thousands of people were dying every year from infections such as smallpox, a disease that has now completely disappeared, thanks largely to vaccines. Fast forward to today, when advances in science and extensive research have given us an array of vaccines that protect against more than twenty infectious diseases. Although we get most of our vaccines as young children, it’s important to continue vaccination throughout our lives, even as adults! But how do we know if we need a vaccine? 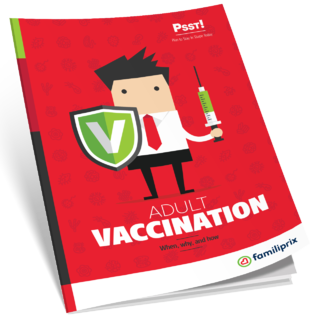 That’s what you’ll find out in this guide, designed to answer your questions about vaccination for adults.